Published: Sep 9, 2014 to ? Kono Subarashii Sekai ni Shukufuku wo! has been published in English as KonoSuba: God's Blessing on This Wonderful World! by Yen Press since November 22, 2016. Alternative version: Kono Subarashii Sekai ni Shukufuku wo! In a world filled with lots of new anime revolving around games and being forced into them, Kono Subarashii Sekai ni Shukufuku wo! is the breath of satire needed for the genre. When you hear of an anime about being stuck in a RPG, you been programmed to believe the main protagonist is a kind-hearted, gifted, over-powered person. Not with KonoSuba. The story itself is weak, as it does follow the typical quest/reward aspect of the genre. However, what it lacks in story it makes up for in satire, waifus, and abundant comedy. If you're tired of SAO, No Game No Life, .hack style anime, then look to KonoSuba for that comedic view of them. I hope this review can be useful. English is not my nacional language so It will probably has some mistakes. Story: It's a summary of the Light Novel. It adapt better the novel than the anime, because It's more complete. Art: It's good. The art remembers the anime style. Plus, in my opinion, the art of an comedy manga doesn't need to be too great. 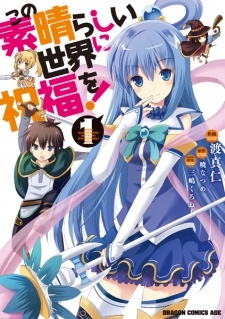 Characters: The main characters are Kazuma, Megumin, Darkness and Agua. Kazuma is a scumbag from another world that wants to have an idle life. Megumin is a Crimson Demon who loves explosion. Agua is a goddess and Darkness is a hard level masochist. They are very original and funny. Enjoyment: I liked very much. It's funny and is more complete than the anime. Overall: This can be a good shoot If you don't want to read the novel. However, If you've watched the two seasons of the anime, I wouldn't recommend this one., because It's the same story. Why does the megumin spin-off manga not have a mal page?